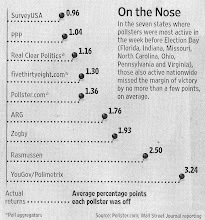 The composite polling of the last 7 polls before election day in 2008 gave Obama an average of +11.93. He won WI with +13.90, almost 2 points better than the last polling convergence. So, if he is up on Romney (who will be the nominee, btw) by 10, then he will probably win by 12. You may want to look at who the undecideds are in your poll before you scream Goldwater. They are all people who already have voted for her for Vice President. There are no undecided Obama voters left in the matchup. The undecideds will almost all vote for her given who they are. So what you're saying is you do think she'll get annihilated, just not by historical proportions? "So what you're saying is you do think she'll get annihilated, just not by historical proportions?" No, I think what he is saying is that your polls are so tainted, only the DailyKOS kids and people of their ilk believe you guys. At a time when O is crashing in the Gallup and Rasmussen dailies and other respected polls like YouGov and Quinnipiac show him losing altitude big time, you guys have him "winning handily" everywhere. We'll see what numbers you continue hiving up in gas prices stay elevated or increase further. What a croc your bogus polls are. Like I said earlier, no one else is polling as much as you guys these days. So you have the floor to yourselves until other pollsters join the fray who can then be compared to you guys. Until then, you are free to push any meme you want, to keep your sponsors, the far left blog DailyKOS happy. One day, I predict you will come back down to earth with your polls. Tom Jensen can tell you if I am way off here, but I think you are comparing apples to oranges here. His approval ratings are a key to his popularity and his reelection chances, but they don't line up exactly, to say the least, with his reelection chances. When asked if they had to choose between Romney and Obama, for instance, people might not always be thrilled with Obama, but they'll vote for him anyway. It's not clear whether that's because their slight disapproval is outweighed by their overall happiness with him, or because the Republican candidates are just that unappealing. Maybe it's both. Whatever the case, it's entirely believable that he's doing well in center-left or deep blue states despite having mediocre approval ratings nationally, which by the way aren't crashing down. Is Palin still leading in the WI GOP 2012 race like she was in December? Smooth Jazz - You are full of it! Obama isn't "tanking" on Gallup: he's been between 45% and 52% for a very long time now, he's at 46% at the moment. PPP's state general election polls aren't so much showing that Obama is overwhelmingly popular. It's that the GOP candidates are incredibly unpopular. Re: Rasmussen - Unlike PPP polls, their polls have been proven to be biased. Proof: Rasmussen Republican Bias In 2010.